This simple Chocolate Cherry Granola Frozen Yogurt Bites Recipe is a must-have for dessert AND breakfast! It’s too good not to be used for both! About a month ago, I talked about how I was trying to get healthier by swapping my sugar with the #GoodbyeSugar30 Challenge. My experience with it was good and bad. I realized that sugar goes into a lot of things I eat. Like, pretty much everything it seemed. Seriously. Why is this necessary?! Meal planning was a whole lot harder than I would have liked it to be once I started truly looking at the labels beyond the calorie count. Honestly, I wasn’t nearly as successful as I had hoped to be with this challenge. This challenge was a tough one for me. I apparently love sugary things a lot. And when I’m stressed or tired for busy (all super common as a new mom, btw) – I crave these sugary things like there is no tomorrow. All the being said though, I am super grateful I took this challenge. I feel much more educated as to what goes into our food. And I also felt a lot better when I cut back on the sugar laden food. Nathan and I both watched our ingredients closer so it was a team effort for us, too. Another thing I learned? Not all sweeteners are alike. I talked about it in my last post, but I love the new SPLENDA® Naturals Stevia Sweetener. It’s the newest addition to the SPLENDA® line with no added favors and no bitter aftertaste. (This is why I love it so much! That bitter aftertaste from most is awful. )The reason this sweetener is a little different is because it’s filled with a stevia extract that is rich in Reb D (versus Reb A that can have a bitter aftertaste.) It can be found at retail stores national wide in 40 and 80 count boxes. For more information, visit SplendaNaturals.com. So I was excited to use the SPLENDA® Naturals Stevia Sweetener in a few recipes. One of which was my favorite because it was a healthier option for when I was tired, stressed or busy and craving something sweet. 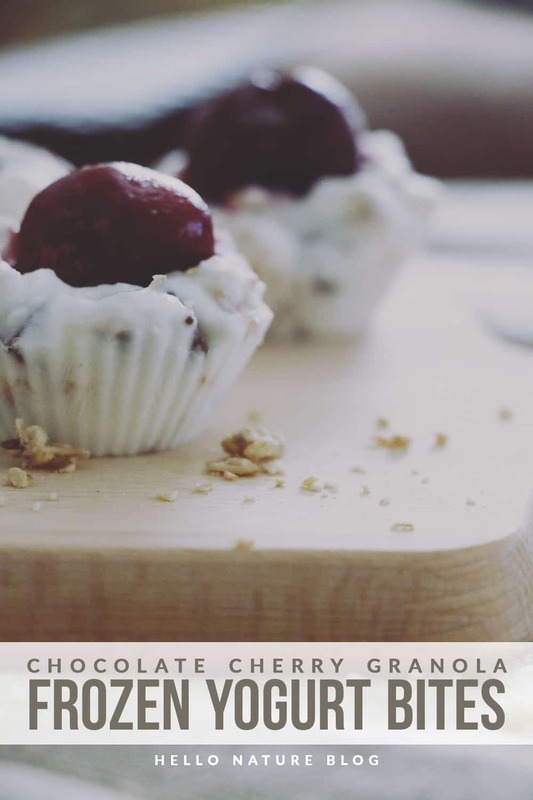 Chocolate Cherry Granola Frozen Yogurt Bites. Just typing it out makes my mouth water. Seriously. This frozen yogurt bites recipe is so simple, but it’s super tasty. And it kind of feels like it’s a dessert that can be eaten for breakfast which is a total win in my book. Plus it takes less than ten minutes to make. What isn’t there to love about this recipe? If you’re unfamiliar with the #GoodbyeSugar30 Challenge, here’s more information. It’s a simple challenge to identify where you can easily swap out the added sugar for the delicious new SPLENDA® Naturals Stevia Sweetener. The goal is to give you easy tools to make small change in your life that will aid in reducing added sugars and calories, without sacrificing taste. I’m excited to take what I’ve learned from this challenge and continue to use it to eat healthier. I’m also looking forward to making some more recipes with it! What are your favorite recipes with sugar swaps? Anything you would add to this frozen yogurt bites recipe? Have you reduced your sugar intake at all? If so, how did you feel? These look perfect. Must make these little bites of yumminess! OMG! I cannot wait to make these! Yum and sugar free! These look amazing! I love the frozen yogurt part! It’s like a snack and dessert in one. Thank you for sharing this!! This looks incredible and so beautiful. Perfect for hosting. Oh wow this looks so yummy! I love all the ingredients. It’s such a clever healthy snack. Oh, what a great and healthy snack! This would be a great afternoon pick me up! Oh yum! These looks so delicious. It’s great that they are healthy too, because I am definitely going to try making these, and will most likely NOT be sharing! This looks delicious. I’m going to try this. Yum! These look so delicious and incredibly easy to make. Thanks for sharing! Oh these look so yummy, I can’t wait to try them! Oh my goodness! Those look so tasty!! Chocolate and cherry are so good together! OMG, these look amazing. Can’t wait to make them. These look like perfect party food! Thanks for taking these along with you at Fiesta Friday party. I hope you enjoy the party and the crowd. Have a fab weekend! Sounds great! Sorry it took so long to visit – I’ve been off on vacation! Thanks for sharing on the What’s for Dinner link up! Oh wow…I can’t wait to make these for my boys – one of my boys LOVES cherries! Thank you for linking up to last weeks Creative K Kids’ Tasty Tuesday. Don’t forget to link up this week, if you haven’t already!